Luton boss Nathan Jones insists his side are already well equipped for life in League One. 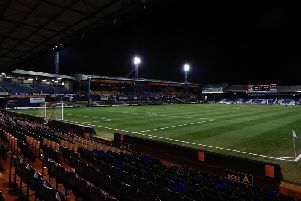 The Hatters sealed promotion to the third tier of English football last month by drawing 1-1 at Carlisle and secured second spot with a 3-1 victory over Forest Green Rovers at the weekend. We’d like to add a little bit more quality as well, so it’s going to be a big summer. On how he feels the side can do at the next stage, Jones said: “We believe we’re equipped for it. “How equipped we’ll have to find out, but we believe we are equipped for the level. “We’ve got a good structure, got a good way of doing stuff, got some wonderful footballers here. After over 10,000 supporters were at Kenilworth Road on Saturday, enjoying great scenes of celebration on the pitch afterwards, Jones believes he has delivered what set out when he took over back in January 2016. He continued: “The fans have deserved it and I know what they’ve gone through. “That responsibility when I came here was not just about trying to win a game, you’re taking on a lot of heartache, a lot of hurt and I think we’ve rewarded them. “The one overriding thing that we said when we took over was we were going to give them a team they could be proud of and I think they’ve got that. “They can be proud of this team, this team is brave, this team is bold, this team goes out and tries to win games and play. “Sometimes we stutter, but 53 per cent of the time we’ve won and only probably 15 per cent of the time we’ve lost games. Luton finish their campaign at Notts County today, with almost 5,000 making the trip for one last hurrah, as Jones added: “Lets enjoy this for the minute (beating Forest Green) and then through the week we’ll knuckle down and work hard to keep being professional. Town would need to score six times to reach the 100 goal mark for the season, but Jones wasn’t overly fussed about that, adding: “One hundred goals is lovely to get to, but they mean nothing if you didn’t get promoted. “We’ve got promoted, so any other statistics after that is just gloss really. “I don’t think we could have had any more accolades this year, no-one’s scored eight, seven, seven, like we’ve done, the standard of goals we’ve scored have been superb. “Some of the awards for the performances we’ve had, we’ve had five players in the EFL team, five players in the PFA team, we’ve been promoted, how many more things can you do in a season?